PHUKET: Khunying Kanchana Na Ranong died about 1 pm yesterday after suffering a heart attack at a Samitivej Hospital in Bangkok. She was 84. A well-known and much-respected figure on the island, Khunying Kanchana was Chairwoman of the Pearl Group of Companies, which includes the Indigo Pearl resort at Nai Yang, Toyota Pearl Co and the Pearl Hotel in Phuket City. She also held many other prestigious positions, including Chairwoman of the Phuket branch of the Royal Chitlada Projects shop and a member of the Phuket Provincial Red Cross committee. Previously she had been President of Lay Judges at Phuket Juvenile Court. 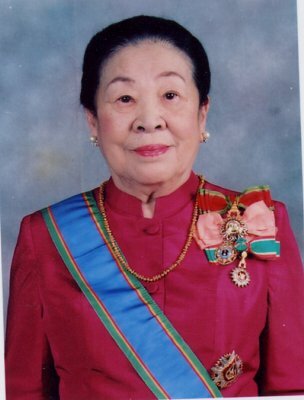 Khunying Kanchana, a recipient of the Phuket Mother of the Year Award, leaves behind four children: sons K. Wichit, President of the Tourism Council of Thailand, and K. Wiboonchai; and daughters Wipapun Kusawan, President of the Phuket Professional Business Women’s Association, and Wimonwan Banreangjit. K. Wipapun told the Gazette that her mother in recent years had been suffering from increasingly severe allergy attacks, which became more tiring for her to recover from, and that she had been receiving treatment in a Samitivej Hospital in Bangkok for more than a month after suffering a back injury. Khunying Kanchana’s body arrived back in Phuket today and is being interned at Wat Wichit Sangkaram on Narisorn Rd, in Phuket City, until her funeral, which will held 1 pm, December 16, at Wat Chalong. The funeral will receive a royal blessing.